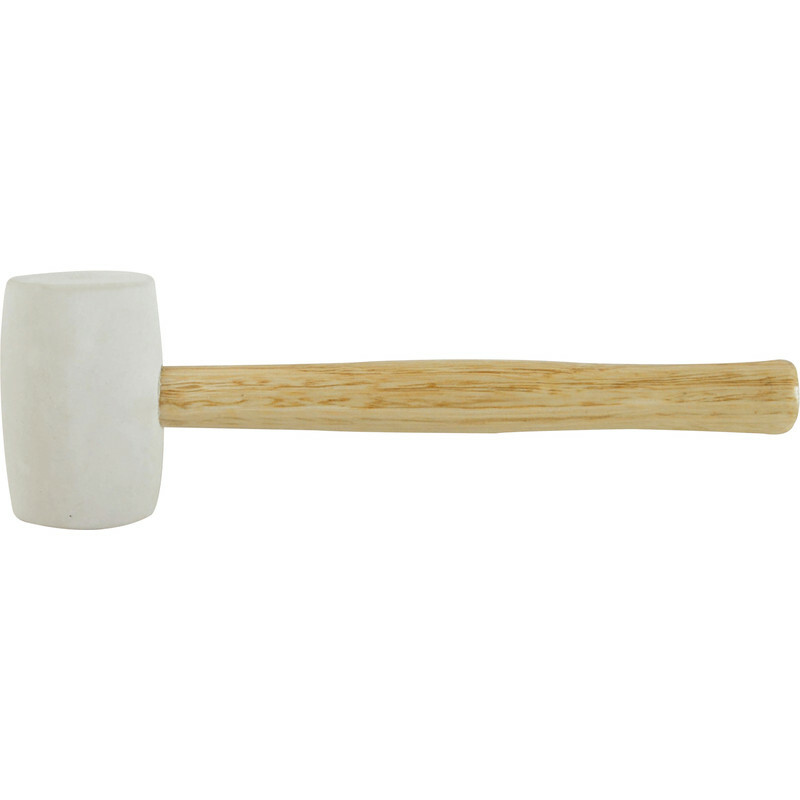 Semi-hard white rubber mallets will not mark or discolour surfaces. 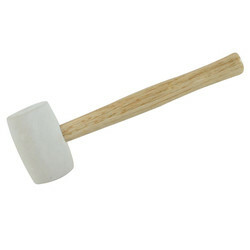 White Head Rubber Mallet 24oz is rated 3.7 out of 5 by 10. Rated 4 out of 5 by SussexFactor from Chip off the old Block Bought white for non marking, so fine on grey stone, so reasonable for price it did the job well on a 154 600 x 600 pre cast 38mm slabs on a 50 to 70 mm bed. One point the head did come off, and rubber split at the point where the nail was positioned too close to handle, so guess this is one off, removed the nail turned mallet to other side and repositioned nail, carried on no problem, still plenty of life in it. Rated 1 out of 5 by DIYerPete from Not robust enough! The rubber head is only held on by one nail through the shaft. Unfortunately the nail on mine was not straight and missed the shat, so the head flew off after 3 hits! Rated 1 out of 5 by SMAW from maybe I was unlucky I bought the mallet last week to have a second mallet so we could make quicker progress building a shed. sadly I was not using a lot of force to line up the bearers and the second tap resulted in the Handel snapping and head shearing off. Honestly didn't think I used much force more a weakness in the handle. Too much effort and petrol to return the product, you get what you pay for! Rated 5 out of 5 by diymostthings from Excellent quality - top value I needed a rubber mallet to position and set flagstones onto a mortar bed. This was absolutely perfect for the job - It made a nice "spongy" contact with the stones and I felt that there was no chance of the blow cracking them even with failry hard "whacks". At a price that was about 2/3 the price of the nearest rival. If you want one you would be foolish to buy it anywhere else.